Seems like there's a new neighborhood electric car built every minute! As I discover new companies making excellent NEVs, I'll put them on the website; and for ease of reading and faster loading, I'll split the pages into manageable chunks. Sometimes these car companies will go out of business, too. If you hear of one of these NEV manufacturers going out of business, contact me (link at the top of the page) and let me know, okay? I'll put it here. Cute, classy, inspired. This electric European mini-car gets more than 30 miles on a charge (the manufacturer claims 35-40 miles, but I feel skeptical). Regenerative braking, 48v system, solid construction. More and more dealers are offering these excellent little cars, and the executives of American Electric are auto industry vets. Update:...and the bad news is that American Electric isn't making the Kurrent anymore, they stopped production in 2008, I believe. You can still find them around, though. More on the Kurrent here. These are the most well-known of the true neighborhood electric cars. They are made by Daimler-Chrysler, and have been in continuous production for a LONG time. At least ten years, probably more. And they're still in business as of 2018. ...this company isn't likely to disappear soon! This neighborhood electric car sits up high, like a little minivan. This will make you feel more visible to the cars around you than if you were in a low-slung model, and also improves visibility for you, too. 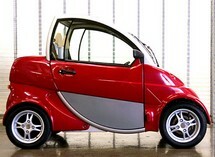 More about GEM electric cars here. These are really cute little (four passenger!) sedans, made in Canada, by Dynasty cars. 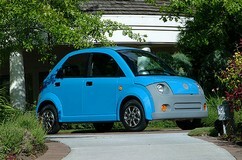 They are true neighborhood electric cars, meaning they go 25 mph, have four wheels, and weigh less than 2500 pounds. This neighborhood electric car is really designed to be just like regular cars. If you like the Toyota Echo - remember those? ...you'll like this miniature electric version, too. Read more about IT electric cars by clicking here. One type of designer wants to do something really different, because - I don't know, because they can! Electric cars are so different from gasmobiles that you can just let your imagination be your guide, as long as your imagination leans towards light and aerodynamic. Another designer wants to give people something comfortable and familiar, so they design their electric car to resemble the gas-chugger it's supposed to replace, in order to appeal to more mainstream buyers. This is a new kid on the block, and carried by only a few dealerships nationwide...but look for lots more of them as time goes on. Update: These are no longer being built, though they're still available. I've done a little research on the Miles electric car which you can read here. Go back to Neighborhood Electric Cars I.